Thanks to the outpouring of support from skaters and food lovers alike, we have raised $760 from Bake Sale For A2A as of last night. I am deeply appreciative of your generosity and hope you’ll enjoy the cookies and jams. What’s even more exciting is that a final decision has been made by the race organizers and the 30th Anniversary Athens To Atlanta will be held on October 9, 2011 as originally scheduled! The good news doesn’t end here. Soon after I deposited your donations, I continue to receive more orders. We are now past the $900 mark! Once I sort out the numbers, I will make a second donation to ensure your support goes directly to the race as soon as possible. I am touched by everyone’s involvement and enthusiasm. Last week had been an emotional rollercoaster of numerous farewells. No matter how often I have been dealing with partings since I was a teenager, every fresh one continues to wrench my heart. We began the week with the passing of a well-loved political figure whose last message to Canadians inspires us to be more generous and inclusive. It is rare that leader of political party appeals to so many different demographic whether or not we agree with his party’s ideals. His early death is a great loss to Canada and I am worry about the uncertain future of the political landscape for the time to come. On a more personal level, last week also saw the last day of a team member at work as he prepares for an exciting career move. Coworkers come and go so what was the big deal? Well, every once in a while, you come across the rare opportunity to work with a closely knit group of people who are smart and truly enjoy each other’s company. Our team had been intact for one full decade building something we are very proud of. Within the last few months, we have lost half of our team. And now with the departure of the creative force behind our work, I am doubtful of our team’s future. What saddens me the most is the end of an era in all of our lives. At my home, there is a clear divide between boy’s food and girl’s food and burger indisputably belongs to the boys. It’s not that I don’t like burger. I rarely crave juicy beef patty between soft sesame bun fully dressed with melted cheese and the works. So I would only make burgers at home if requested by the boys. Therefore, it was totally out of character that I made Café Salle Pleyel Hamburger from Dorie Greenspan’s Around My French Table for my own supper. Fortunately, this burger has plenty of character that kept my culinary interest. 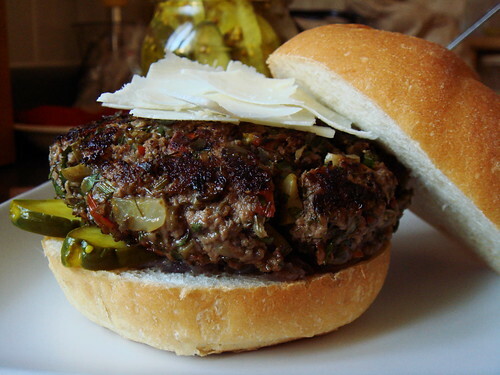 The juicy bison patty was studded with capers, cornichons, oil-packed sundried tomatoes, parsley, and dill for a uniquely Gallic take on an American classic. It was piled high with shavings of Parmesan cheese and served with homemade bread & butter pickles and red onion marmalade in a Kaiser bun. I knew my bread & butter pickles would come in handy one of these days! I have never been interest in cooking or eating ratatouille even after the release of the highly entertaining animated movie of the same name. 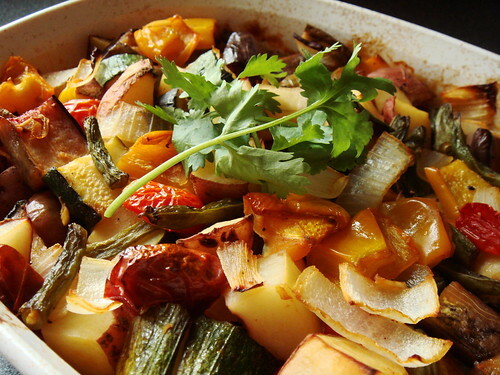 A medley of summer vegetable overcook to oblivion simply goes against my own sensibility never mind that this is a classic dish enjoyed by many. Oddly enough, I had the pleasure of experiencing the dish at both ends of the spectrum this week. On one end, it was a homemade version using locally-grown produce cooked long and slow to achieve a harmony of summer taste in every yielding spoonful. On the other end, it was a mass-produced buffet offering that languished at the steaming table yet the vegetable chunks were squeaky tough and tart enough to make my face all scrounged up. The massive divide between the good and the bad made me realize why some people have such strong prejudice against certain dishes if they’ve only come to know the dish by the worst of the worst interpretation. 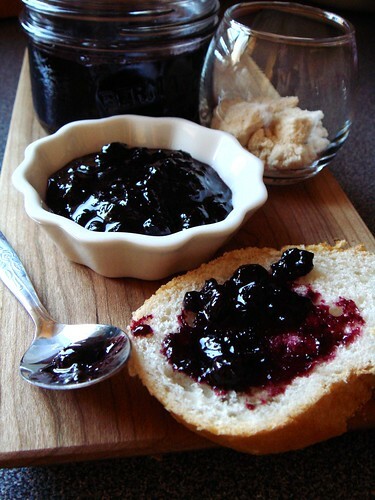 Sugar plays a vital role in jam as a preservative. Do you know where your sugar comes from? Is it made from sugar canes or beets? And how do they get it so white? Those are questions I don’t think about much and I am not here to preach the evils of refined sugar. However, for those who seek alternative sweeteners, maple syrup is a popular option here in Canada. It seems us Canadians have a tendency to give maple syrup as gifts whenever we visit foreign countries. After all, we are the largest producer of maple syrup in the world and it is a local specialty that we’re rightfully proud of. Having said that, I have to chuckle every time my relatives in Hong Kong tell me “please stop getting us maple syrup! I don’t know what to do with them!”. Apparently pancakes drowned in maple syrup is not as popular overseas. 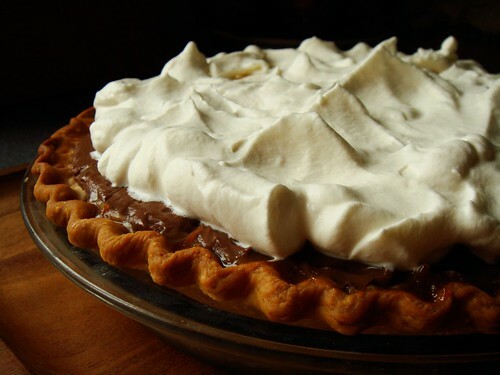 My pursuit of pie perfection began over ten years ago at my first class in culinary school. In our Introduction To Bakery Arts course, we made apple pie using shortening pie dough. For the first time, I learned to look for the subtle marbling of fat and flour that flakey pie crust hails from. I learned to seal my pies with care so every drop of fruit juice stays within the confine of crust. 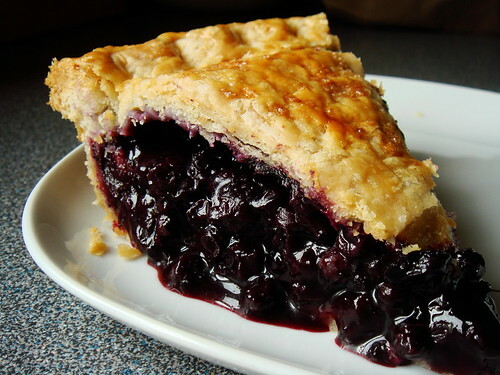 I learned to identify that delicate balance when you slice into the pie and the filling is so juicy that it threatens to spill onto your plate yet it doesn’t as if by magic. And I learned to be discerning and ruthless when it comes to evaluating the bottom crust. On one hand, I’m glad that I learned the finer details that set a pie apart from its mediocre brethren. On the other hand, I had never been satisfied about my own handiwork since. I often insist that recipe is merely guideline and advices from more experienced cooks. Ultimately it’s up to my own hands to carry out the execution and my own tastebuds to judge the result. In the case of pies, it is even more so. Try as I may to divine the secret to pie perfection from a recipe, it is my technique that matters. I had almost given up hope on ever achieving the pie of my dreams until my passion for pie-making was rekindled last year. I came close a few times but close to perfection is not the same as attaining perfection. That is until last Friday’s happy coincidence. Being a competent home cook and baker has its perks. One of which is the ability to feed my love ones with food they enjoy, vegan or not. Last Friday I had dinner with my best friend from grade 7. We’ve been through a lot since and I feel blessed that we remain close friends to this day. She has always love animals so it’s no surprise that she’s now fully embracing the vegan lifestyle. I baked her two batches of vegan cookies as a small gesture. 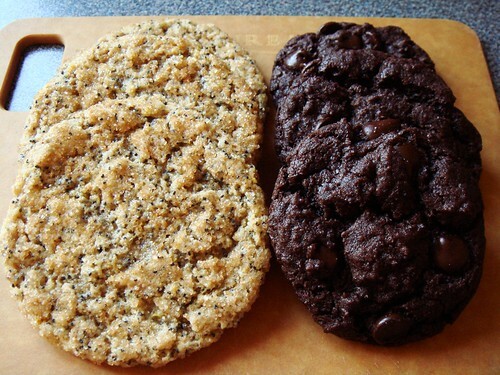 The cookies you see on the left are Lemon Poppy Seed Spelt Thins and the cookies on the right are Cinnamon Chipotle Chocolate Cookies. 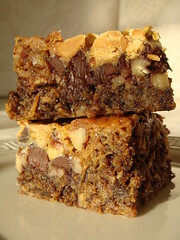 A few years ago I experimented with vegan baking and had great success with Dreena Burton’s recipes. The basic recipe is making a dough using quickbread method with oil, maple syrup, and a bit of molasses for flavour. 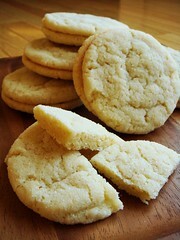 All ingredients are standard pantry staples yet the result is tender cookies that rival their non-vegan counterpart. The best part is the ease of the recipes. 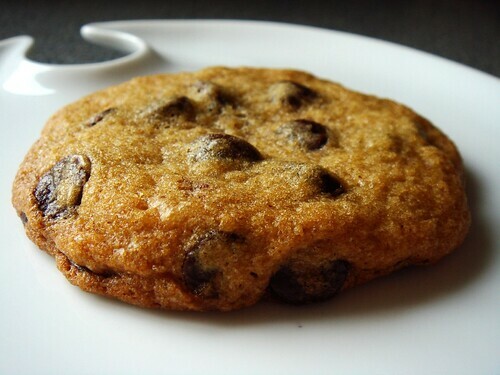 I can typically bake a whole batch within 30 minutes from the time I scale out the ingredients to cookies cooling on the rack, clean up included! I confess that I often feel a little smug when I hear about other people’s food hang ups. I pride myself on having an adventurous palate and I embrace tastiness in all its guises. Horror of horror, I realize today that I do have hang ups of my own and one of them is completely irrational. You may recall that I am not a fan of melons. I did not explain why but it is the same reason I shudder at eggplants. Don’t get me wrong, I love the taste and texture of eggplants! It is those pockets of seeds that make me go “ewww” like a little kid. I wouldn’t foist unto you my mental association of those seed clusters. After all, I don’t want to ruin it for everyone if you’re completely okay with them. Just take my word that making eggplant caviar for this week’s French Fridays with Dorie is not exactly my idea of a good time. I recently came to the realization that I’m in the minority among my friends for eating bread unadorned. I can understand if the bread is plain like baguette or sourdough. They are good canvas for spreads or jam or toppings or butter. 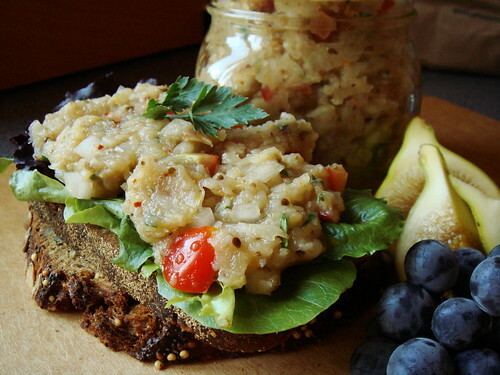 However, if the bread is already enriched with dried fruit or nuts or herbs or cheese, why not savour it as is? I remember I once brought in some parsley cheese scones to the office and all were left untouched. Apparently without pats of butter to spread on the scones, they were deemed unappealing. Alas you miss out! Those scones were so tender, cheesy, and flavourful! I made a batch of Buttermilk Biscuits with Parsley & Sage and brought them to the office this week. 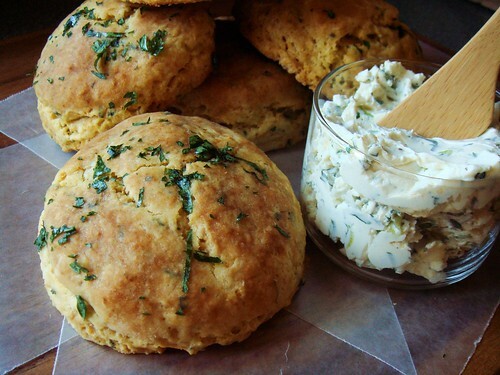 The taste of these biscuits can absolutely stand on its own with herbaceous sage, flakiness from butter, richness from heavy cream, and tanginess from buttermilk. But! This time I learned my lesson. To entice my tasters, I served them with a pot of herb cream cheese that I quickly whipped up using scallions, parsley, and thyme. These biscuits were gobbled up quickly. Whole Foods prepared food department is a good source of inspiration when I’m in a salad rut. Much to their employees’ annoyance, I like to hover around the glass display case and read each label carefully to decipher the list of ingredients for every item. I was jonesing for recipe to make use of cucumber, purple bell pepper, and an assortment of grape and cherry tomatoes I have in the fridge. When I saw a bowl of their Peasant Greek Salad sitting front and center in all its colourful chopped vegetable glory, I knew I found my answer. 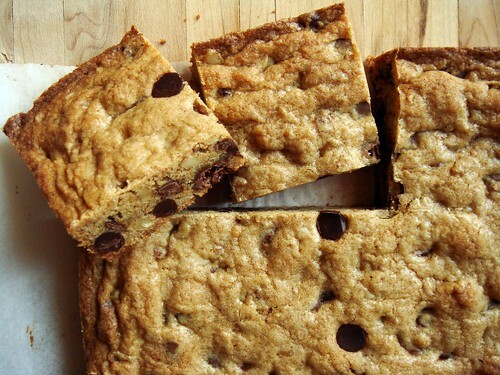 A really neat thing about going to Whole Foods for inspiration is their online recipe database. In most cases, I can find a close approximation or even the exact recipe for what I see at the store. 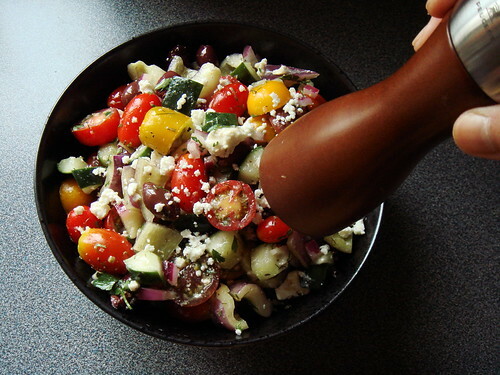 A quick look at their Greek Salad recipe shows a dressing made with olive oil, red wine vinegar, and fresh oregano. It doesn’t match the ingredients I saw in store but it’s already a good starting point. Until I found every fresh and dried herbs in my home except for oregano.